China Journal: An Eco-Utopia In The Desert? Jiayuguan, China—My first question to the mayor, naturally, is about the porpoise. 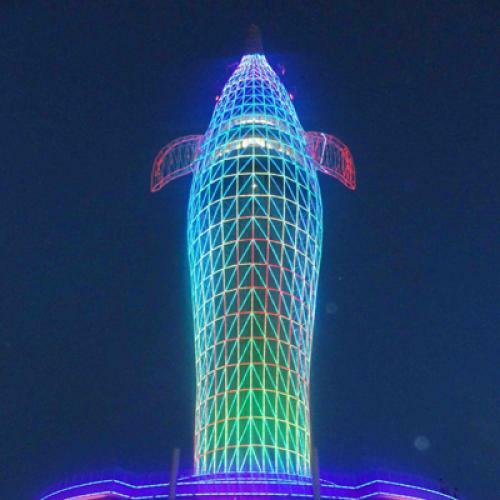 On the outskirts of Jiayuguan, an industrial city of about 300,000 smack in the middle of the Gobi Desert, there's a 15-story-tall steel dolphin, standing erect, balancing a giant ball on its nose. 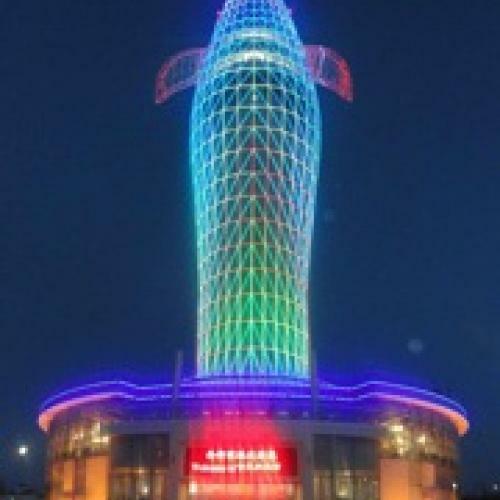 After dusk, the structure is set ablaze in bright neon, its flashing flippers visible from miles away. "That's not a, uh, native species around these parts, is it?" Nope. Turns out, the dolphin is just a large hulking metaphor: "We want our town to rise up," says the mayor, "like the dolphin rises out of the water." Well, fair enough. Before the 1950s, there was virtually nothing in this old Silk Road outpost apart from the westernmost tower of the Great Wall. Then iron ore was discovered in the region, and the government built a steel factory in 1958. Today, it's the fourteenth-biggest steel producer in the country, churning out some one million tons per year, and other heavy industries have waddled on in. Jiayuguan has become a magnet for college-grad engineers and boasts one of the higher per-capita incomes in China (although it's not wealthy like Shanghai is wealthy—the streets are eerily devoid of cars, save for the lorries and construction trucks roaring around the traffic circles). But the city's breakneck rise isn't what's interesting—that story has become a rusty cliché in China. What's intriguing is the fact that Jiayuguan is trying to become a model eco-city, a large-scale experiment in green Chinese living. Every building has solar panels propped up on the roofs, soaking in the desert rays. Instead of riding gas-guzzling scooters, the locals putter around in electric bikes that hum softly down the sidewalks. Despite the behemoth iron-and-steel complex on the edge of the city, the air is remarkably fresh and clear—above clean-air standards for 91 percent of the year (in Beijing, the air reached this level only 67 percent of the year in 2007). Partly that's because strong winds from the southwest carry the flue gas from the coking plants away from the urban center. But credit also goes to the flurry of environmental measures the city is tinkering with. The steel plant, for instance, captures the waste gas that's used to cool the hot coke and generates electricity with it. Likewise, excess heat from the steel and iron works doesn't just dissipate into the air—the city harvests it to warm residential buildings (a majority of homes in the city get at least some of their heat this way). To save electricity, many buildings have solar water heaters. Roughly a quarter of the city's industrial waste is recycled, far more than is typically the case in China. Mind you, it's not all pristine: The steel plant is still in the process of building a wastewater treatment plant to get in compliance with national clean-water laws. But, collectively, the green initiatives are remarkable by Chinese standards. Heck, they'd be decent by European standards. But that all aside, there's no question that coal is still king in Jiayuguan. When you land in the city's single-runway airport—which handles just two flights a day—the first thing you see off on the dirt-swept plains are two behemoth coal-fired plants, belching up carbon all day and night. Freight trains are constantly slinking into town carrying coal from other provinces. According to Xinke Yu, the city's deputy director for environmental protection, up to 87 percent of the city's electricity comes from coal (as does all of the power consumed by the steel and iron works). Ideally, that will change, and the city is lining the desert with a vast array of silicon solar panels, including a large new 100-megawatt farm. By 2020, solar is expected account for some 40 percent of the electricity produced in the region—a staggering amount by any measure. Yet, when pressed, Yu conceded that, despite these efforts, the city's carbon emissions will keep rising for the foreseeable future, especially as the steel complex triples its output in the coming decades. Green measures can slow the relentless march of CO2, but the city is growing even faster. At some point, Yu explains, the absolute level of carbon emissions will decline. But when? "That's too difficult to say," he concedes. "Hopefully as science and technology keep advancing…" Then he pivots back to outlining Jiayuguan's solar plans. All told, then, Jiayuguan is a bit of a mixed tale. It's nice to see an alternative to the grimy, blackened industrial wastelands that tend to crop up often in images of China. And stricter environmental rules haven’t prevented Jiayuguan from thriving. Interestingly, many provincial officials in China seem to take for granted that there's a trade-off between green and growth. The other day, an official in Xi'an province, who had studied at Cal State Fullerton back in the 1980s, tells us: "This is what I learned from American economists: If you want to make the economy grow fast, relax your environmental rules. And if you want stricter rules, economic growth will suffer." So Jiayuguan is a decent counterpoint. But how significant are all these efforts in the scheme of things? The city's emissions, after all, will continue to rise even after the coming solar boom—and this is in a city that gets a whopping 3,000 hours of prime sunlight each year. What's more, because solar power is so much more expensive than coal, much of the new, clean electricity will have to be sold on the grid and sent elsewhere, where the bill can be split with the rest of the country. In essence, Jiayuguan's solar endeavors are being cross-subsidized—if every city in China tried to emulate it, the costs would pile up very quickly. And yet the stakes here are very high. Later I find out that the ludicrous giant dolphin isn't just for show—it's a metereological center, with a Doppler radar hidden in the ball perched on the dolphin's nose. Scientists there have been nervously watching the snowpack in the nearby Qilian mountains recede for the past 20 years. Here in the parched northwest, Jiayuguan depends heavily on the snowmelt for its water supplies, and further warming could be devastating. Droughts are becoming more frequent and the hungry Gobi continues to encroach—the city is planting thousands of willow trees to fend off soil erosion. On the first floor of the dolphin building is a science hall with a vivid exhibit about how hotter temperatures will roil China. It's a far more forceful display than you can find in, say, the Smithsonian's Museum of Natural History. But here in the desert, at least, few people seem to need the reminder.